It has been widely reported that design and technology (D&T) saw a drop of 38,680 entries for GCSE in 2017/18. This was double the losses of the previous year and the single largest fall of any GCSE subject. However, amid the pressures that the EBacc exerts there are enterprising ways to help reverse this trend. Enabling students to see the possibilities that D&T offers and how it can be applied to solving everyday problems is key to the subject being seen as relevant and helping to increasing its popularity. Raising the profile of the subject with parents, the local community, as well as within school, and encouraging cross-curricular approaches also influences uptake. In addition to the timetabled D&T lessons – one lesson a week at key stage 3, three lessons for GCSE and six lessons at A level – I run a D&T STEM club to engage the students and build on their experiences in the subject. We seek out national initiatives that give the students experiences and opportunities to excel, I therefore introduced the students to the Design Museum’s annual Design Ventura competition. Students are challenged to respond to a professional design brief, to create a well-designed product that improves everyday life, requiring students not only to research, design and develop a product prototype but also to consider marketing, manufacturing costs, profit margins and sustainability. These are all criteria that contribute to GCSE and A level courses and we therefore approached the competition as if it was a mini-GCSE project. The students worked as a team, they met regularly during lunch breaks to discuss research and consider proposals before setting themselves tasks for the following week. One group responded with a unique problem that a family member had identified. A student had been helping her grandmother transplant some seedlings and she was exasperated with storing so many different sized pots and the fact that they regularly broke, which was also a waste of plastic resources. This was the birth of the Petal Pot. Design Ventura provides the opportunity for a concept idea to become reality as the prize sees the winning design developed, produced and sold in the Design Museum shop – this was a real motivator for the students. Ten shortlisted teams are invited to pitch their product concept to a panel of judges – design and business professionals, as well as retail experts – at the Design Museum. This year more than 14,800 students from 328 schools across the UK entered. Once we discovered that the Weatherhead High team had been shortlisted the whole school came forward with their support, from drama and English helping with the pitch presentation, to ICT assisting with embedding music clips into the PowerPoint. With the whole school rooting for them the Weatherhead team left the Wirral very early on a December morning to make their pitch. And after a long wait, in February they returned to London for a celebration at which Weatherhead was announced as the winner of this year’s challenge! The hard work then began with design, marketing and business professionals, coordinated by the Design Museum, to develop the concept into a final product. During meetings and Skype conferences with the development team the students viewed samples of the revolutionary Gum-Tec material (made from recycled chewing gum) from which the pots were later manufactured, considered packaging mock-ups and pricing. The fact that we won Design Ventura 2017/18 finally hit home when we arrived at the Design Museum on the launch day, seeing the product that we had worked on, guided by the Design Ventura team, developed into a saleable product. The proceeds from the sales of Petal Pot will be donated to the team’s chosen charity, Claire House Children’s Hospice which is based across North Wales, Chester and Wirral. What began as a Tuesday lunchtime club in my workshop evolved into something very special. Seeing the students mixing with people such as Naomi Cleaver, Sebastian Conran and Christoph Woermann (managing director, global head of marketing at Deutsche Bank) has been a privilege. As well as delivering their pitch and attending the awards ceremony, the students had the opportunity to meet many designers from a variety of disciplines who shared their journeys into the design world, illustrating how ideas can become reality. To complement this, the students have gained life-skills through participation in team-building, problem-solving tasks and product development workshops. The effect of winning Design Ventura has been immense within the local community. 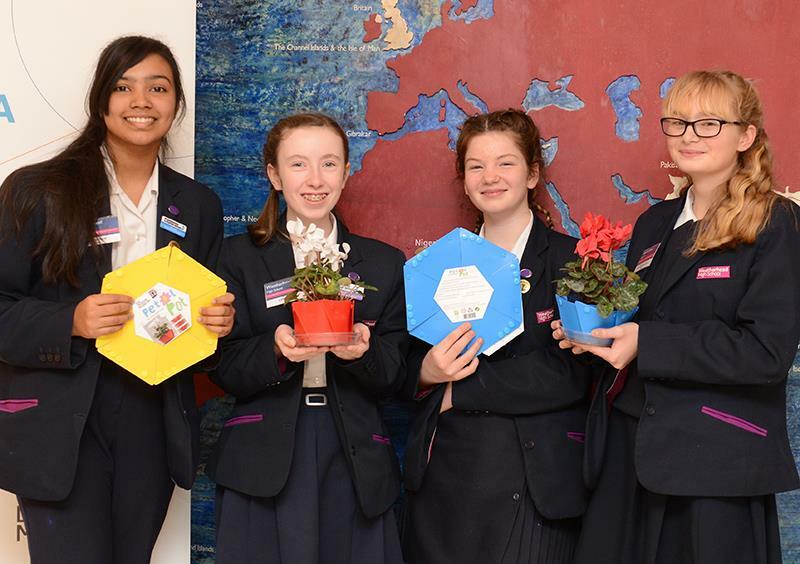 The profile of D&T within the school has risen significantly, with the four students now known as The Petal Girls by the year 7s. There are a variety of displays around the school that celebrate the achievement and we have also featured in the termly school magazine in addition to presenting a report to the school governors. At the recent open evening, prospective parents were enquiring about the Petal Pot having read articles in the local newspaper and from our website. They were impressed by our willingness to look beyond the local community to broaden their daughters’ educational experience, which is an influencing factor for them when applying for secondary school places. Parents have been particularly impressed with how the Design Ventura competition provides insight and opportunities for enterprise. The number of students attending the STEM club has risen and several key stage 3 students are already proposing ideas for this year’s entry. There is a real buzz in school about the product and how new materials such as Gum-Tec are being developed from otherwise waste, polluting products such as chewing gum. The publicity and success from this experience has helped recruitment numbers at GCSE and A level, as students can now see the possibilities the subject holds for them and how it can be applied to solve everyday problems for real clients. In addition to the students gaining a wealth of experiences from the Design Ventura, it has also been a source of personal CPD. I have accompanied the students through the process, the workshops and seminars, gaining many insights into the world of design which I can draw on for my teaching, as well as working with professionals outside of education. At times there was a lot of extra work, organising the various trips to London and meeting the deadlines on top of my day-to-day workload, but to see the joy and sense of achievement on the girls’ faces and to see the students blossom into confident young women has been incredibly rewarding. Rhiannon Pearson teaches design and technology at Weatherhead High School in the Wirral, a comprehensive girls’ school with a mixed gender intake at sixth form.